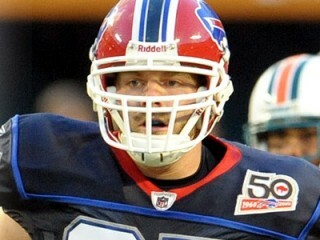 Garrison Sanborn is an American football long snapper for the Buffalo Bills of the National Football League. * Vs. MIA (10/4) … snapped a successful snap for a K R. Lindell 35 yd. field goal and was successful on a snap for an extra point. * Vs. TEN (11/15) … successfully snapped for two PATs, one field goal, five punts, and recorded his second total tackle, first unassisted on special teams. * Vs. MIA (11/29) … successfully snapped for four punts and two field goals … the longest was a 56-yard FG to give the Bills the lead 17-14. Graduated from Prattville High School … was a Class 6A all-state selection as a senior tight end and on defense, leading Prattville to the state quarterfinals … rated as the nation’s No. 9 tight end by Rivals.com. In 2009, Garrison participated in the Toyota Rookie Club appearing at numerous community events throughout Western New York and Southern Ontario. The Toyota Rookie Club helps the franchises newest players become more involved in the Western New York community. Each month, Garrison and all first year players did one community appearance as a group. The Toyota Rookie Club events included a visit to Dave & Buster’s to play video games and host a pizza party with pediatric cancer patients hosted by Brian Moorman’s PUNT Foundation, a visit to the Lawrence Park Collegiate Institute Panthers in Toronto, Ontario to discuss the importance of sport and activity with the student-athletes and to present the football team with $3,000 in new equipment for the school’s football program, and a trip to the Northwest Buffalo Community Center in November 2009 where the Rookie Club Members served Thanksgiving Dinner to approximately 300 children and families. In addition to serving food, the players introduced themselves to the community members during a brief ceremony, sat and ate with them, and signed autographs. The final Rookie Club appearance of 2009 took place at the Annual Bills Holiday Party. The Rookie Club and Bills veterans hosted nearly 100 children from a number of different local community organizations. The Annual Holiday Party gives children from the organizations an opportunity to celebrate the holidays with the Bills players, Jills cheerleaders, Billy Buffalo, and Santa Claus. The children received a holiday dinner, pictures and autographs and gifts from a wish list that they had previously submitted. Garrison has also made appearances to the Play 60 event in the Buffalo Bills Fieldhouse to stress the importance of being active 60 minutes every day. View the full website biography of Garrison Sanborn.